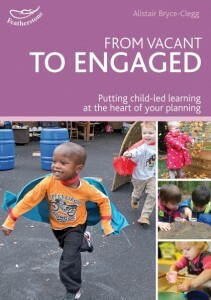 Putting child-led learning at the heart of your planning. For children to make progress in all aspects of their learning the practitioners who work with them must have a good understanding of what the child already knows and can do (assessment). They should be able to create activities that will take the children forward to the next step in their learning (planning). Finally they should measure the impact of those activities on the children’s attainment (evaluation) and then the process can start again. The one crucial element that this model lacks is ‘engagement’. Based on the fundamental truth that, you can have the best provision and the best resources in the world but if you have not got the engagement of the children that you are working with then the potential for high level learning is minimum to none. This book will show through practical examples how practitioners can move away from the more traditional model of teaching (as above) to one that maintains all of the essential elements but is driven by the most powerful learning tool of all – engagement.